An adorable private cottage with a loft on 70+ acres in a gorgeous setting with private driveway. Rustic, cozy and secluded, this country gem is just minutes from the six Prairie Mountain Wineries. High speed WiFi. Friendly dogs welcome. Trust us, once you walk through the door, you'll wish you could stay even longer! BlueBird Hill Farm BnB is a rural B&B with spectacular views centrally located to OSU (30 min), U of O (45 min), numerous wineries (5-60 min), ocean (90 min), golf (15 min), scenic hiking & biking. Unwind on-site in comfortable surroundings & explore the area. Neil continues his employment at Oregon State University as a professor of Food Science, while Sue serves as your hostess at Bluebird Hill Farm B&B and Cellars. We, and our bluebirds look forward to sharing our comfortable country home and panoramic views with you and your traveling companions! Welcome to our country bed and breakfast and farm stay, near Junction City, OR. We're conveniently located between Eugene and Corvallis, and 20 minutes to the Eugene Airport, and 3 miles from the wineries. We're all about home style accommodations and country living with two cozy guest rooms and an RV site available, as well as a guest barn for horse travelers. Check out our website, call us or email us with questions. We can't wait to meet you, have a glass of wine, and share the country with you. This is a peaceful place to relax after you enjoy the 7,100 yard championship golf course or tour the Prairie Mountain Wineries. Unwind, sip wine or grab a beer with friends, watch the wildlife in our four beautifully appointed master suites each with its own private bath, plus a loft with pull-out bed, three roll-aways, and much floor space for sleeping bags. The Diamond Woods suite has a private patio, fireplace and Jacuzzi tub. Inn at the 5th - Unique. Unexpected. Unforgettable. 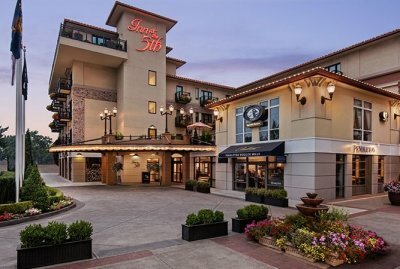 Inn at the 5th represents the pinnacle of Pacific Northwest luxury, offering elegant accommodations and the ultimate in personal service in the bustling heart of downtown Eugene, Oregon. Our luxurious boutique hotel echoes all that makes Eugene unique, from its artistic, sophisticated design to the high-end dining, spa and shopping available onsite at the 5th Street Public Market.